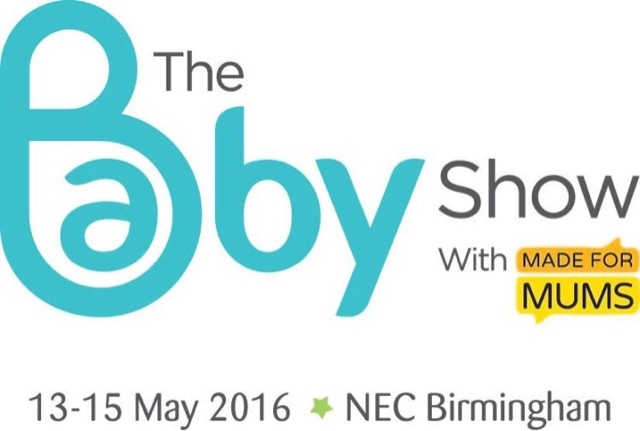 2 Wives 2 Mums: The Baby Show NEC - what we saw & what we bought! The Baby Show NEC - what we saw & what we bought! 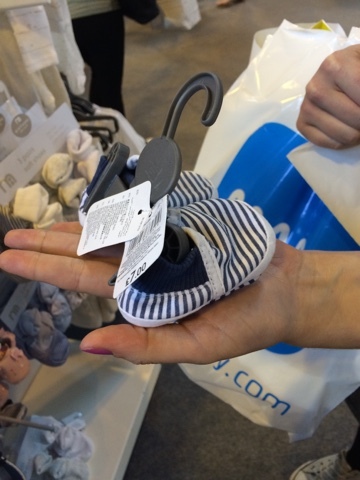 This weekend was The Baby Show at the NEC in Birmingham, and we were kindly invited along to give our verdict - we are obsessed with anything baby related, and are avid shopaholics, so were more than happy to take them up on their offer! Firstly, what is The Baby Show?! The Baby Show runs three times a year - one in Birmingham, and also two in London - Olympia in October and ExCel in March. An exhibition of all things baby, the shows are jam packed with stalls offering everything from nappies to feeding solutions, clothing to photography, big names brands to smaller companies offering innovative products you may not otherwise have heard of. There are also guest speakers, offers, demonstrations, and lots of advice on hand - perfect for parents to be/new parents navigating the baffling world of baby! Although many visitors are still very much with bumps, the show is also great for visiting with little ones, with facilities including a Tommee Tippee feeding area including bottles, bibs, spoons, microwaves and Perfect Prep machines, and a comfy breastfeeding area. 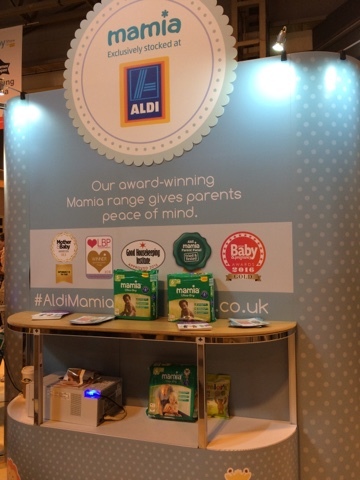 Aldi have a changing area stocked with their Mamia nappies and wipes which are free to use - their nappies and wipes have won numerous awards, often beating Pampers. We will definitely be trying them out if we decide cloth nappies aren't for us - plus they are a bargain! Finally there is also a creche on hand offering 90 minutes of free childcare. 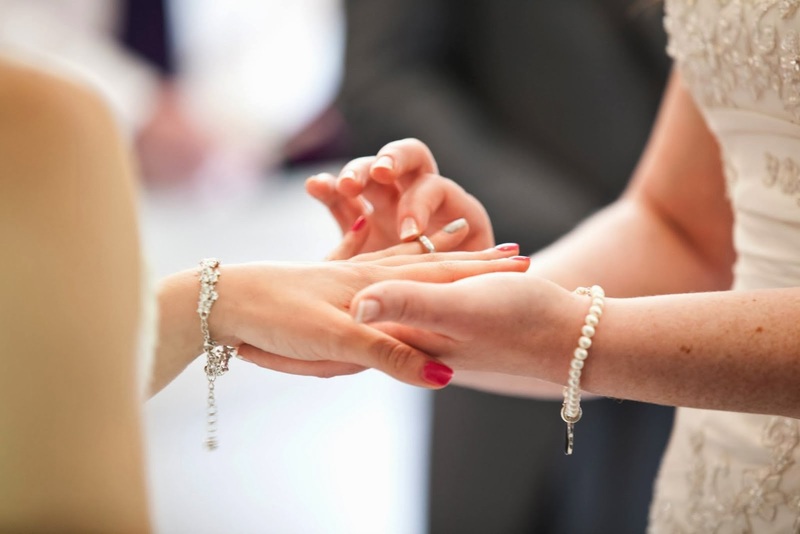 There are also great facilities for people who don't have kids in tow, including a cafe, and the Emma's Diary Shop & Drop where you can drop off your purchases as you go, then either collect them by hand, or by car from the collection point. Fab if you get a bit carried away! 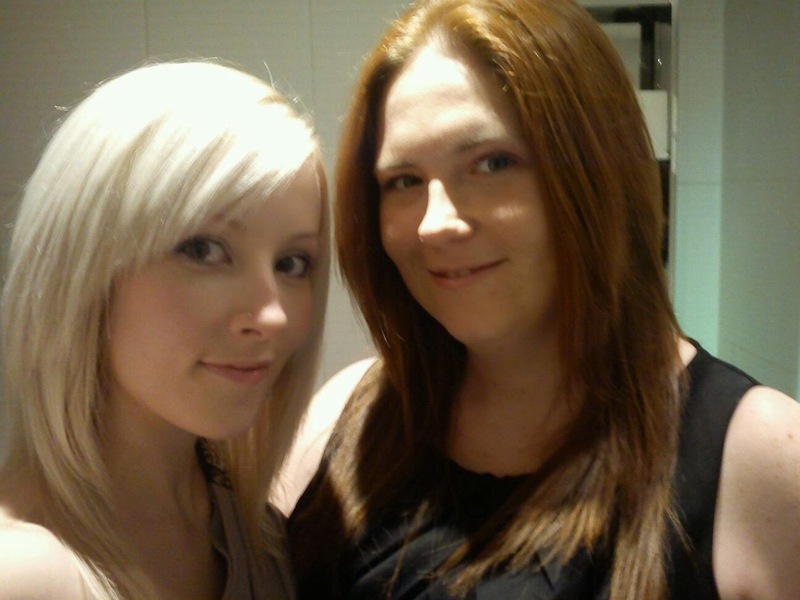 It was our second visit to a Baby Show, our first being to Olympia last year when we visited very much out of curiosity, as Lauren was only 6 weeks pregnant. We have to say overall we preferred the experience of Olympia. Birmingham NEC was a larger venue, but we found it a little confusing to navigate. 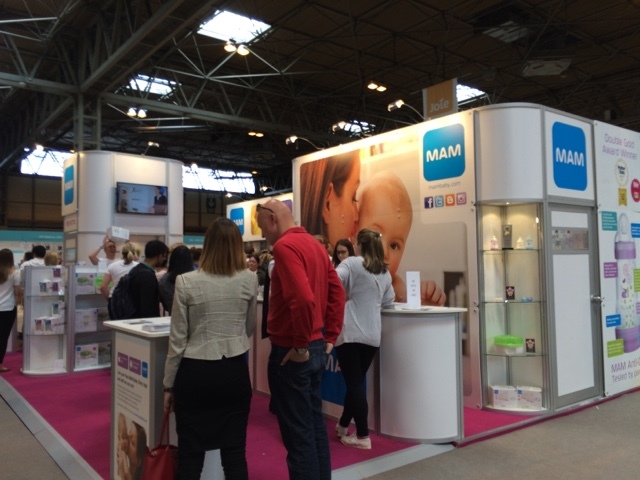 We also felt there were much less offers and freebies - at Olympia you were greeted as you entered by a Mamas & Papas stall offering huge shopper bags of goodies for £5 if you signed up to their email list. They also had 30% off some of their travel systems. This time the goody bags were free, but tiny in comparison. The only offer on travel systems was a free car seat when you purchased a complete travel system - useless to us as we already have a Mamas & Papas car seat, and numerous other shoppers felt disappointed by this offer too. We didn't see any of the baby magazines either, who usually have great goody bags - we felt there was a better choice of stalls at Olympia, and some of the staff at the NEC on a few stalls seemed a little disinterested! 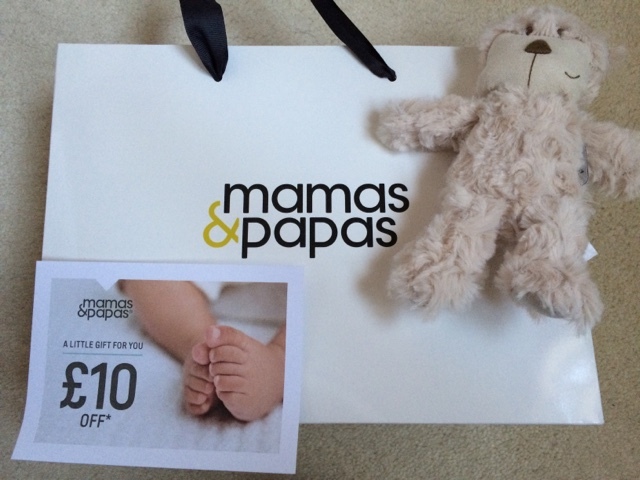 The 'goody bag' from Mamas and Papas! However we still hugely enjoyed the show - its a great opportunity to ask big brands for advice and info, and get questions answered you otherwise wouldn't have asked. We also discovered some new smaller brands, and caught up with some existing favourites, including the lovely ladies from Cheeky Wipes, who remembered us from the Olympia show - however we have already bought pretty much all their products! We were however excited to learn that they have new items coming out in June! Our first stall was MAM, who have a wide range of bottles, soothers, teethers, food and drinkware, and toothbrushes. They had an offer on everything except bottles which was three for £10, and were also giving away a self-sterlising bottle and soother to every family - probably the biggest freebie on offer at the show! 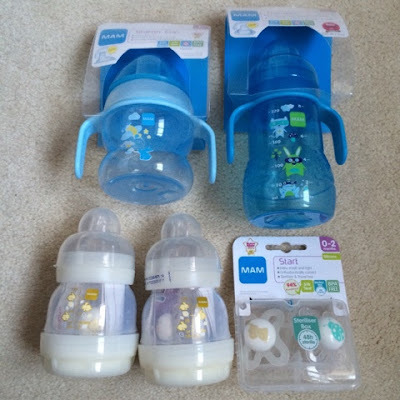 We also purchased two training cups, and a pack of two soothers. The dummy / soother vs no dummy / soother is often a hot topic amongst parents - very much like the breast vs bottle debate. Our views on this are very much along the lines of many parenting decisions, we'll go with the flow. We bought some because we are happy for our son to have one, if it helps him settle, but will be controlling when he uses it, i.e. bedtime! 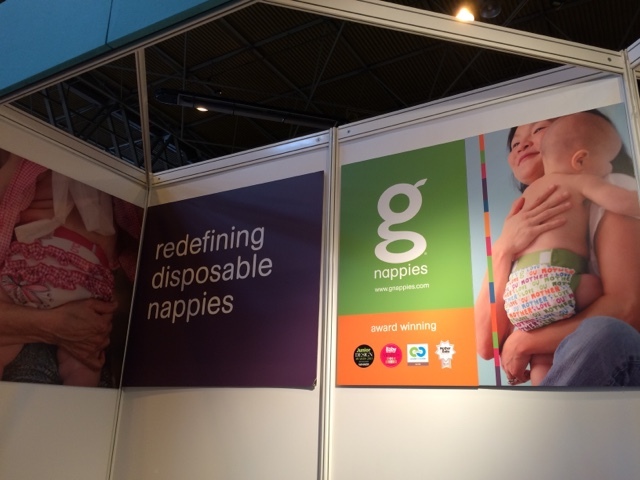 Our next stop was G Nappies, a brand we had not heard of, but as we are very interested in eco friendly products, especially reusable nappies, we stopped to take a look. 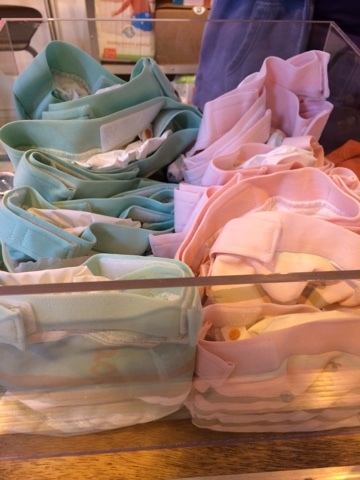 Their staff were really helpful, explaining that the nappies 'redefine disposable nappies', and are great for people who love the idea of reusable nappies, but are new to them, or aren't sure whether washable nappies are the right product for them. 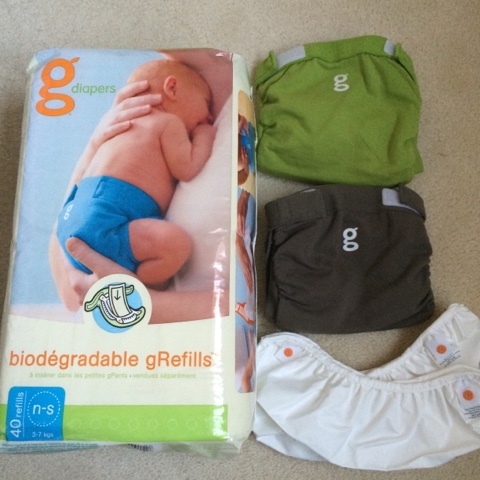 G Nappies are adorable reusable fabric nappies that come in lovely colours and prints. They have an inner plastic waterproof liner, and a biodegradable or washable liner. Wet liners are biodegradable or compostable, and soiled ones can be flushed away. We thought the idea was really interesting, and purchased a show offer Starter Kit of two nappies, four plastic liners, and a pack of 40 biodegradable liners, for £30. We look forward to reporting back, and hopefully purchasing more cute designs! 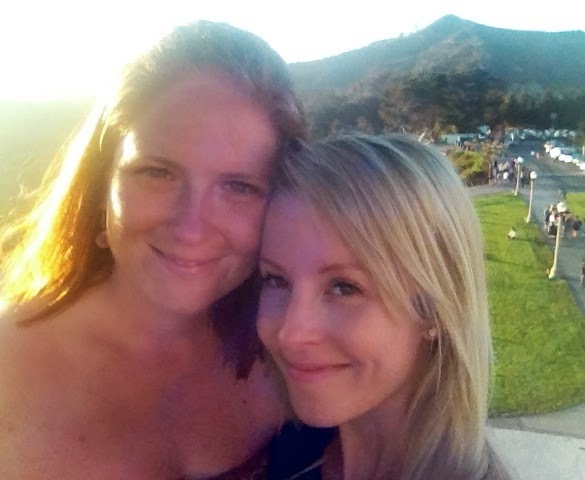 Medela was our next port of call, a brand Lauren knows a lot about through her career in midwifery. Medela are the 'breast feeding experts' and we were interested in items that would assist Lauren to express and store breast milk, and for me to be able to feed our son expressed breast milk. 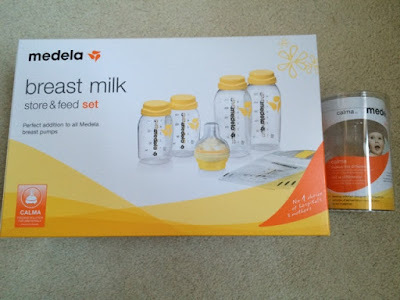 We purchased their Swing Breast Pump, and a Breastfeeding Store & Feed Kit containing four breast milk bottles, one Calma teat, and five Pump & Save bags. We also purchased an extra Calma teat - Calma teats are designed to mimic breastfeeding as closely as possible, and make the transition from breast to bottle and back again as easy as possible. Our next stall was Gro, another brand we are familiar with after using their Gro reusable suction cup black out blinds for when Lauren worked nightshifts. 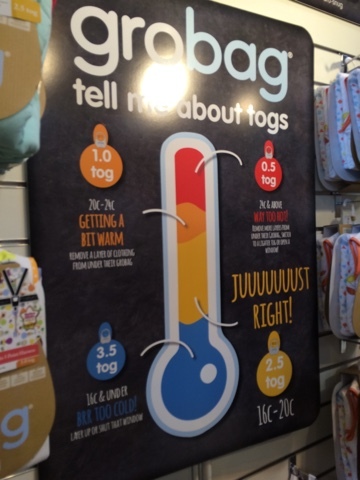 They are most famous for their Grobag sleep bags, and we found their information on tog ratings to be helpful. We also liked the Gro Clock, a clock that displays either a sun or moon to train children when its time to sleep/get up, and were intrigued about their newest product, the Gro Hush, a portable baby calmer that plays white noise that only the baby can hear. We weren't sure whether we would need this, or how much we would use it, so left this as a possible purchase for another day. We are also undecided whether instead to buy a Ewan Dream Sheep - a much talked about cuddly sheep who plays lullabys to soothe babies to sleep - however when we visited their stall, the staff were too busy looking at their phones, so a definite no sale from us! Sadly Gro's only offer was a £99 bundle of products, which wasn't suitable for us. We did however purchase a Gro Egg, a digital room thermometer that changes colour depending on the temperature. 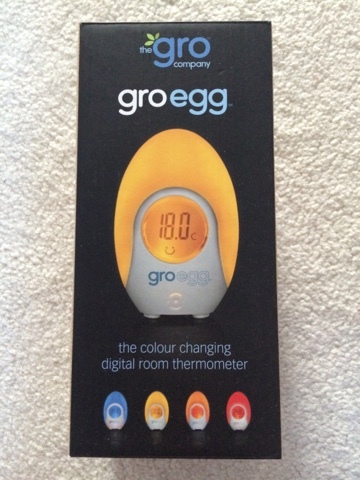 An ideal nursery room temperature is between 16 and 20, so we were pleased upon trying this out to discover ours is 18. 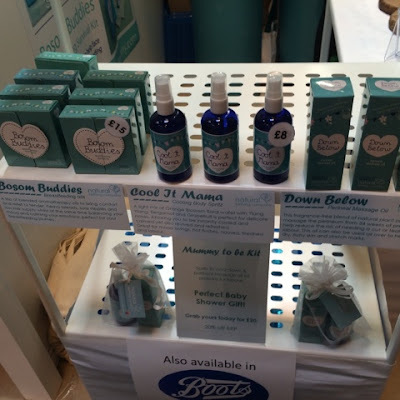 Something we were keen to discover at the Baby Show were natural baby toiletry brands. We ideally wanted something with no parabens, artificial fragrance or SLS, and vegan & cruelty free if possible. 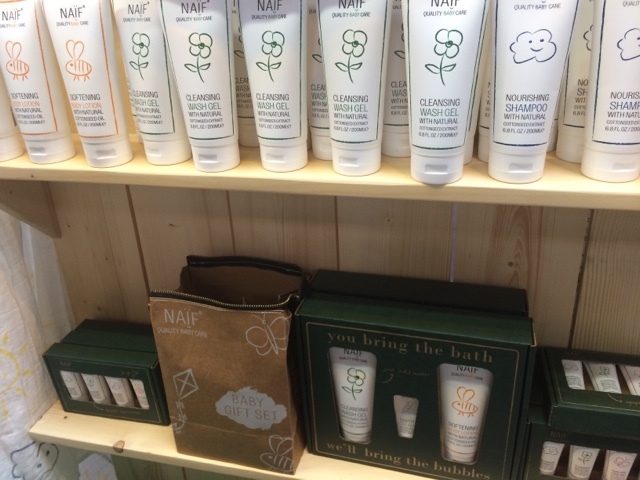 The first one we came across was Naif, which is also available at Boots. However the salesman didn't seem to sure on product information, and the only starter bundle he seemed to have available was £40. We also discovered upon reading the label that the products contained artificial fragrance. 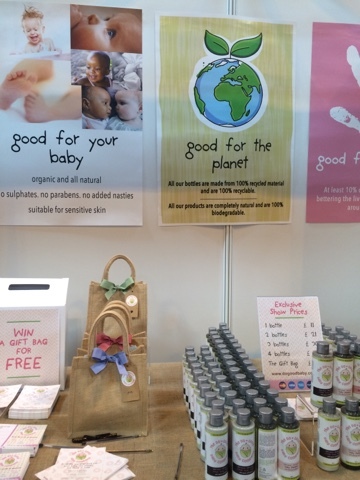 The next natural toiletry brand we came across was the Do Good Baby Company. Their products ticked all our boxes being natural, with environmentally friendly packaging and even donating to charity, but at £11 per bottle, were a bit too pricey in our opinion. They are great for a treat though, and would make a lovely new baby gift! 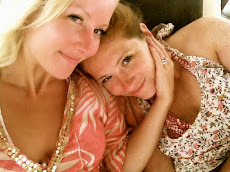 We had heard about the Natural Birthing Company via Twitter, so were intrigued to learn more. The founder of the company, a midwife herself, gave us demonstrations of all of her products, and was extremely helpful and knowledgeable. We found some of the stall holders to occasionally lack passion and enthusiasm for what they were selling, so sellers like this were a breath of fresh air! 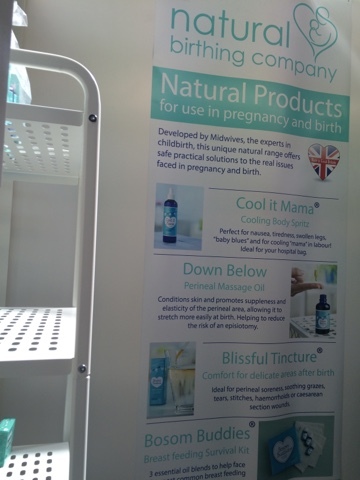 The products - a cooling spray, essential oils for use in breastfeeding, a massage oil, and a compress solution were lovely. 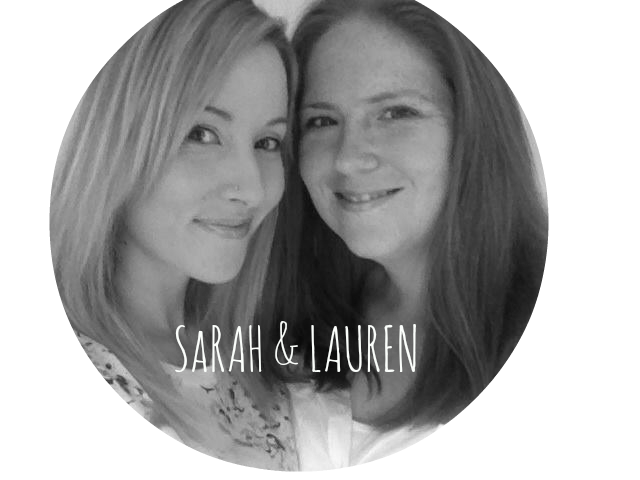 As a midwife with a knowledge of aromatherapy herself, Lauren felt she could make similar products at home for a lower cost, but still considered purchasing as we were really impressed with these products. 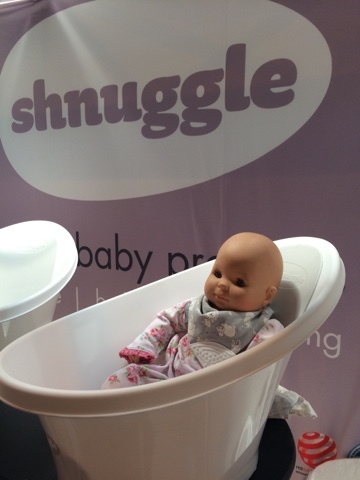 Our next purchase was from Shnuggle, who make these adorable baby baths, perfect for supporting the baby safely in a sitting position, with a comfy foam 'bum bump'. We saw a lot of people carrying these around the show, so they were obviously a hit! Mothercare were offering 10% off everything, which although wasn't the hugest of savings, meant their department was extremely busy - they could have benefited from a few more staff! Lauren was fitted for nursing bras by one of their expert fitters who was really helpful, so we purchased these, whilst falling in love with the tiniest shoes we have ever seen! As we were still on the look out for a sleep bag, a stall packed full of beautifully patterned ones caught our eye. Babasac are also stocked by John Lewis, and their sleep bags are adorable! They are multi tog, with the sleep bags being 2.5tog (suitable for usual UK temperature) , but with a removable layer converting them to a 1 tog (suitable for warmer weather.) With UK weather being notoriously changeable, we thought this was a good idea, and meant we won't have to buy a second sleeping bag for holidays or for changing seasons. 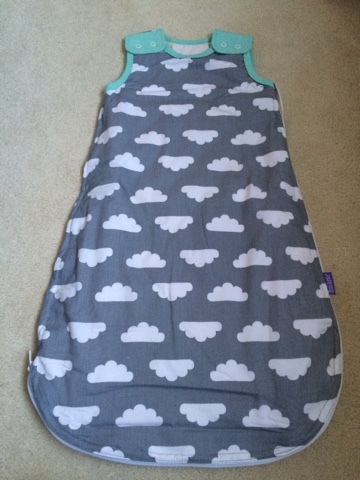 Baba Sac had a great show offer of £15 off, so we purchased this beautiful grey sleep bag! And last but not least, our biggest and most exciting purchase - the pram! 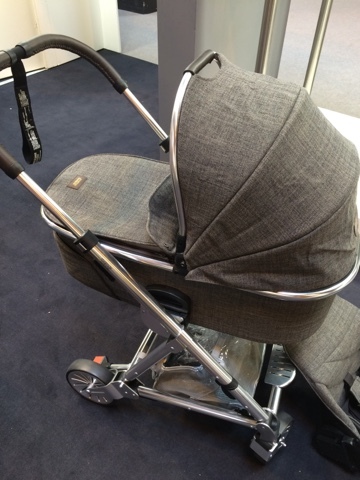 We have to admit, we fell in love with our pram at the Baby Show in Olympia in October last year, and despite looking at MANY others, always come back to this one! At first the idea of choosing a pram, or travel system as they are often called, is daunting and scary. There are SO many to choose from - where do you start? It was actually a Mamas & Papas staff member who initially talked us through what to look out for, back at the show in Olympia, and one of the things we were most grateful for was his genuine interest in wanting to help us understand, the emphasis was on information not selling. 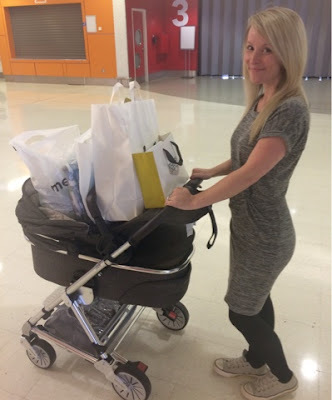 Since then we have visited many big baby stores, compared prams online, tried a few out in shops, and each and every time found we were comparing the one in front of us to the one we had seen and loved at the Baby Show. Therefore we waited until this Baby Show to buy the one we had selected. We went for the Mamas & Papas Urbo 2 in the gorgeous Chestnut Tweed fabric. Although we originally wanted the Armadillo Flip XT, for it's ability fold down ridiculously small and is also suitable for all terrains (not that we will be trekking through wilderness but we do like country walks with Willow!) but upon talking further to the very helpful staff over the weekend, decided that the lighter, easier to manouvre and designed for city living Urbo 2 would be more suited to us. We purchased the pushchair, and also couldn't resist the carry cot which converts the pushchair into a beautiful pram. It has so many great features such as pull out insect net, sun shade and rain cover, a lie flat seat, and a window in the hood so you can check on baby without disturbing them. Not to mention, it looks gorgeous - we are in love with it! So after a long, busy day, we left the Baby Show tired but happy - and luckily with a pram to wheel out our many purchases! We picked up many flyers from brands that we may consider purchasing in the future, and may well decide to return to the Baby Show one final time, with our son. The next show will be at Olympia in October, and our boy will be approximately 4 months old, so we look forward to experiencing a baby show 'on the other side'!